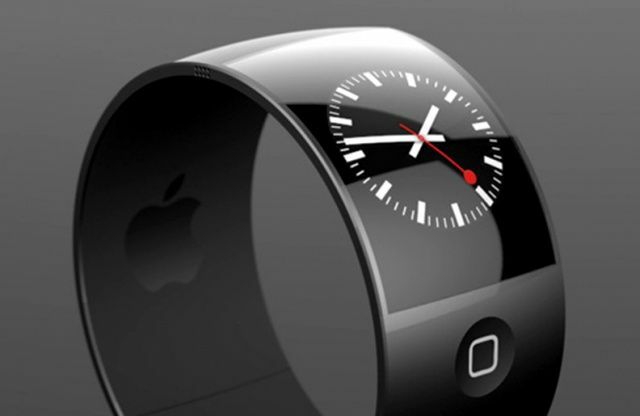 A third-party concept design for the iWatch might look. We learned this week that Google, Samsung and LG are all planning smartwatches. Sony, Pebble, Cookoo, I’m Smart, MetaWatch and Martian already have pretty sophisticated smartwatches available, all of which interoperate with the iPhone. You can be sure that 100 Chinese companies will make inexpensive smartwatches that support either the iPhone or Android or both. Here’s why I believe Apple’s smartwatch will have a market advantage. I believe the usage model for smartwatches will be very different from smartphones. Traditionally, wristwatches were used for telling the time — a one-second interaction. I think smartwatches will also favor one-second interactions, and lots of them. Someone sends you a text or posts a picture on Facebook, you’ll get calendar meeting alerts and other standard types of incoming information, and they will flash on the watch. A future, more pre-emptive and proactive Siri will nudge you about all kinds of random things: “You’re near the cleaners — pick up your laundry,” or “Do you want me to remind Steve about your meeting?” I expect us active users to be glancing at our iWatches 10 times an hour during the day to keep up on one-second messages of all kinds. It makes sense that the iWatch will gently interrupt you constantly. But how? Haptics are the buzzes and rumbles of physical motion you feel when your phone is on vibrate or what you feel in the controller when you play Call of Duty on Xbox and someone tosses a grenade into your bunker. Apple has been quietly integrating custom haptics into the iPhone user interface for years. The feature lets you tap out your own pattern of vibrations, then assign a unique, custom pattern for each contact, if you choose. Hardly anyone uses this feature, and why would they? With a phone, you never really know if you’ll “feel” the buzzing. And even if you can feel some buzzing, an iPhone in your pocket isn’t solidly connected enough to your skin for you to recognize subtle custom vibrations. But with a wristwatch, which is tightly bound to your wrist and in direct contact with your skin, you will always feel haptics. I believe Apple will enable custom haptics for the iWatch. You’ll be able to set up custom vibration patterns for specific people and/or specific types of information, so you won’t even need to look at the watch to get some kinds of messages. You can also be given enough information by buzzing to make a decision even to look at the watch or not look. For example, you’ll have a specific pattern of buzzes for incoming text messages and another pattern when someone in your “Close Friends” group on Facebook posts a status update. If you’re in a meeting with your boss, you might choose to check the iWatch to see the incoming text, but ignore the status update. The boundaries between devices are breaking down. If you have other Apple hardware, such as an iPhone, iPad, MacBook Pro, iMac or Apple TV, you’ll be able to see incoming stuff, then quickly toss it over to another nearby device with a simple command. For example, someone may post a picture on Facebook. You’ll see it thumbnail size on the iWatch, and with a voice command instantly put it up on your iMac or TV. This will be a market advantage only to users who also have other Apple products, but which is a potential market of hundreds of millions of people. Note that I say that was a semi-smart watch because while it ran apps, it didn’t have a third-party app ecosystem or connect to the Internet. In any event, the nano wristwatch was primarily a content consumption device. You plugged your Apple earbuds into it and listened to your iTunes music. I believe Apple’s future iWatch will take it a step further, and enable you to tap into iTunes wirelessly, and listen wirelessly via Bluetooth earbuds. I believe this because Apple is quietly obsessed with Bluetooth 4.0. The iPhone was the first phone ever to get the new technology, and every Apple product since last year ships with Bluetooth 4.0 support. You’ll be able to listen to your music, podcasts, audiobooks and iTunes U lectures. After synching with iTunes, you’ll be able to do this at the gym or while running when you don’t have your iPhone with you. Apple has a “special relationship” with Nike, especially when it comes to the wrist. The nano “wristwatch” had a Nike app. Apple CEO Tim Cook is on the Nike board of directors. And Cook also wears a Nike FuelBand wristwatch, presumably every day. It’s also well known that people use Apple products for fitness more than any other brand of gadget by far. People buy third-party accessories to lash iPhones and iPods to their arms and other appendages, and listen to music, etc., while running, working out, hiking or whatever. They also use third-party fitness apps and accessories to monitor performance. The wrist will be the perfect location for a fitness computer, and Apple is likely to give Nike a prominent place in the pantheon of default apps on the device, as well as a head start on accessories. In exchange, Nike is likely to remain faithful and exclusive to Apple. If the Notification Center is appealing and useful on iOS and OS X it will be massively so on the iWatch. A rational feature would be for the iWatch Notification Center to replace, rather than duplicate, iOS and OS X notifications. By simply detecting the presence of an iWatch connected via Bluetooth, Notification Center messages would appear on the watch instead of the other device, keeping those screens free from clutter and interruptions. The single most killer feature of the iWatch from a market dominance point of view may be female friendliness. No, I’m not being sexist. The undeniable fact is that women overwhelmingly choose smaller, thinner and lighter wristwatches than those normally chosen by men. I predict that most of the smartwatches coming out from Google, Samsung, LG and others will be somewhat like the current generation in their bulkiness. However, Apple’s market savvy and two-part obsessions with both having at launch the thinnest device in every category (iPhone 5, MacBook Air, iMac, etc.) plus Apple’s obsession with curved glass (Steve Jobs said Apple’s new “spaceship” headquarters will not have a single pane of flat glass) — not to mention Apple’s affinity for the Nike FuelBand, which is small, narrow, light, curved and thin — will result in Apple cornering the market for women who choose to wear smartwatches in the first two or three years after they ship. It’s time for the smartwatch revolution. And Apple happens to be ideally positioned to rule this fledgling market like they did the touch tablet market. And they’ll do it with these 6 killer features. Product concept image courtesy of Esben Oxholm.